AKA "Angel" won the 3 year old futurity at the IDMS State Show. 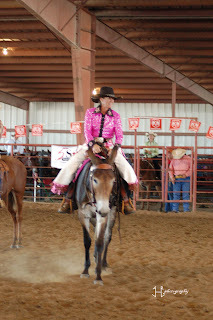 Sue White of Rockn S Mules trained and showed her this year. We foaled and raised this mule out of our jack Greystone and a Scotch Bar Time mare. It has been a joy watching her grow. 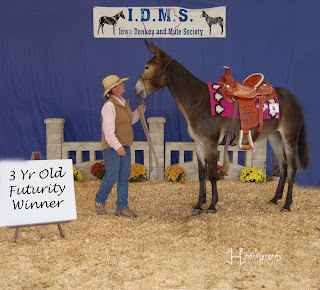 She won the weanling futurity in 2006 and the three year old futurity this year. I don't think that happens very often so we are very proud of her and she will end up being my primary mount once we get ourselves on the same page. In the one picture of just Sue and Angel you can see the two of them were having a discussion over who the boss was. 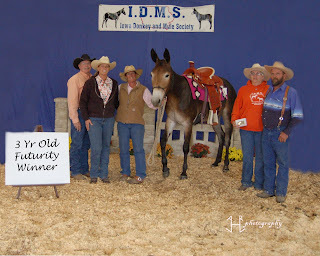 We went to 24th annual Clark County Mule Festival in Kahoka, MO this last weekend. Pictures to be coming in the future but we had a blast and were exhausted when we got home. I am babysitting my granddaughter today so I'll check back later when she gives me some extra time. She is 7 months old and beginning to move around some. Gotta keep a close eye one her. She will be my next COWGIRL!!!!!! Yee haw. Nice! She is beautiful as she is tall! Give Angel lots of trail time and riding time...with patience and you'll both have a wonderful time. As for grandkids! Hah, aren't they just a blast? I wish I could have mine around all of the time! Thanks Val for the compliment on my new steed. I have been working her on the ground and Sue has forbidden me to ride her the rest of this season. She says she doesn't want me to end up injured worse so she thinks me working her on the ground will help Angel to get to know me in the capacity of riding her. We raised her and she was our first baby. She was born looooooong legged and friendlly. We didn't know what we were doing raising mule colts and we handle our colts alot. Well we ended up having a BIG mule that was really pushy with her face and shoulders. That is getting better but all this gound work I'm doing will reinforce that I'm not a scratching post. We're getting there. Sue can make her do lots of things I can't yet but I'll learn. It's sorta like learning how to drive your first car I guess. I babysit my youngest granddaughter so her and I can bond now so when she 5-6 years old she can camp with us and ride Eve or Rosie. Her momma has already asked how soon she can start riding. I told her we need to introduce her to them now. She's 7 months old and it is clear to me she loves her doggie dog. I'll bet if this grandma has anything to do with it she'll love mules as much as we do and she'll be riding and selling our mules some day. Ain't grandkids FUN????????????????? ?